'Uncanny X-Men: X-Men Disassembled' review: The flagship X-Book makes a promising return – AiPT! Despite some flaws, ‘X-Men Disassembled’ is still a strong start to the modern X-Men era. X-Fans couldn’t contain their eXcitement–and AiPT! even commemorated the occasion with its Uncanny X-Month event! The cherry on top was that three of Marvel’s freshest voices–Ed Brisson, Matthew Rosenberg and Kelly Thompson–would be scripting the series with a stable of artists illustrating. As the series unfolded, there were highs and lows and, in the end, it was clear delivering a successful Uncanny X-Men relaunch was always going to be an impossible task, as no two X-Fans can agree on their perfect X-Comic. 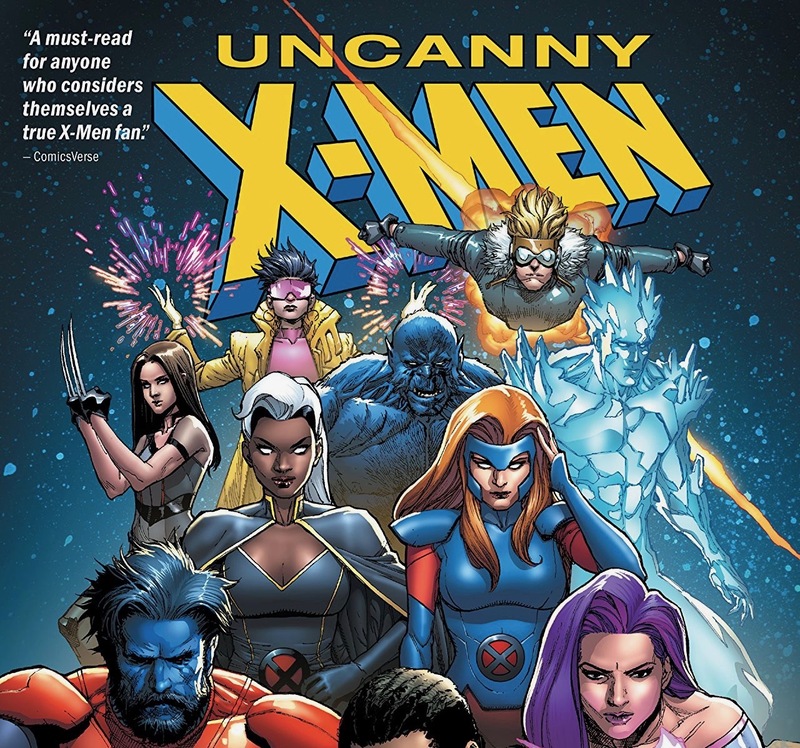 However, reading a 10-part story on a weekly basis is a much different experience than reading it in one sitting in trade paperback form–which is what I did before writing this review for the new Uncanny X-Men: X-Men Disassembled collection. Before I dig into my thoughts on the overall story following a second reading, I’ll give a bit of a summary… because there’s a lot to cover here. The X-Men’s world–and the wider world, in general–appears to have gone mad! It’s raining in the Kalahari Desert. Senator Ashton Allen is preaching to his fellow humans about the positive impact an anti-mutant vaccine will have on mankind. Kitty Pryde has vanished and Jamie Madrox and his army of super-powered dupes are wreaking havoc. And all of this is only in part one! I’m not really spoiling anything when I say it’s revealed Legion and X-Man–the grandchildren of the atom–are the ones responsible for all this chaos. As the wider story unfolds, readers are treated to battles… of so many battles, with the fate of the world at stake. Because if Nate Grey gets his way, we’re getting his version of utopia. Spoiler alert: It doesn’t really gel with the X-Men’s. As there’s so much going on in “X-Men Disassembled,” there’s a whole lot to like about it. For starters, the X-Men actually feel like the X-Men. The Uncanny writing trio’s love for Marvel’s mutants really shines through in their dialogue. And everyone is likable–even Bishop (who spent way too long trying to murder a baby across time)! But aside from witty banter (with Iceman and Jubilee being standouts), this story features plenty of that trademark X-Men drama. The X-Kids are angry the X-Adults don’t take them seriously. Psylocke and Archangel appear to have unresolved relationship issues. Jean Grey’s son from an alternate reality just wiped out all of the world’s organized religions. Drammmaaa! Also positive: the art! The epic kicks off with a bang thanks to dynamic pencils from former X-Men Red artist Mahmud Asrar and continues with the rotating group of R.B. Silva, Yildiray Cinar and Pere Perez. Normally, having a different artist every issue would make for a jarring read, but the styles of each of these illustrators bring to these pages are different enough while maintaining a consistency that makes them all feel uniform. And the same could be said of the writing team. Together, all of the creators deliver one, consistent voice. It should also be noted that this story is insane. The current Uncanny X-Men arc, featuring Cyclops and Wolverine, is dark and grounded in the remaining X-Men’s bleak, new reality. “X-Men Disassembled” is the exact opposite. While the stakes are extremely high, you’ve got X-23 clawing her way out of a dinosaur and Magneto basically rocking Gandalf cosplay (complete with a long, bushy beard). It’s a bit ridiculous at times… but it’s also pure comics and that makes it all kind of awesome. But “X-Men Disassembled” is far from perfect. If you’re a new reader who’s looking to get into X-Men comics, there are better series to start with. This 10-part saga is more of a love letter to past X-Men stories like “The Age of Apocalypse.” X-Man and Legion alone are two of the X-Men’s more complex characters, with Nate Grey not exactly being a household name. And while we get to know the characters over the course of these 10 issues, not everyone gets a lot of time to shine (such as Beast, whose subplot comes and goes throughout the storyline). And the Beast subplot highlights another issue with “X-Men Disassembled,” which is its overall pacing. I strongly believe this didn’t have to stretch over 10 issues. For instance, there’s an unnecessary trip to the Age of Apocalypse that does little to change the story. After a while, this just becomes one long battle that switches from one location to the next. Losing an issue or three could have made for a much tighter story. But part of the problem is the need to set up future stories, such as Rosenberg’s Uncanny arc and the various “Age of X-Man” titles currently on shelves. Upon second reading, all the little teases make more sense. But for someone new to the X-world, these could seem like ideas or plot points the writers simply forgot about halfway through the story. So I’m not entirely sure I could recommend this trade paperback to someone brand new to X-Men. I feel as though the first volume of a series like X-Men Red is a lot easier to understand at a much faster clip. “X-Men Disassembled” may be better suited for a lapsed X-Men fan who’s familiar with all the craziness we experienced in the ’90s. For those fans, it could be a treat to see that Nate Grey has grown up to be Jesus… and the X-Men’s biggest nuisance. Still, there should be enough great work on display in this collection to put X-Fans at ease that we’re in one of the better X-Men eras in recent memory. If you’re looking to read Rosenberg’s Uncanny X-Men or anything Age of X-Man, you need to start here. For X-Fans, there's enough greatness on these pages to warrant a purchase. The same can't be said for non-X-Fans who may get lost trying to follow along. The talented writing team gets these characters and it shows through their constantly entertaining banter. The art is solid throughout. This is a celebration of X-Men history with an emphasis on the zanier aspects of the franchise. There's a lot going on, which could lose casual readers looking for a new reader-friendly X-Men story. The pacing is a bit off at times and the overall event could have been a few issues shorter. This epic's overall purpose is to set up stories not contained in this collection.